The flag is is two sided, obverse is white with Coat of Arms in center, and reverse is horizontally divided blue and red. Proportion is 2:3. 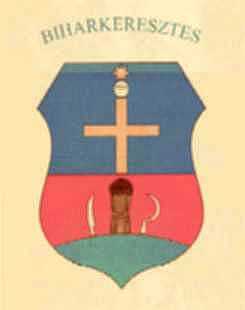 Regulations on the flag of the town (in Hungarian) at <biharkeresztes.farw.hu>. Photos of the flag here and here.